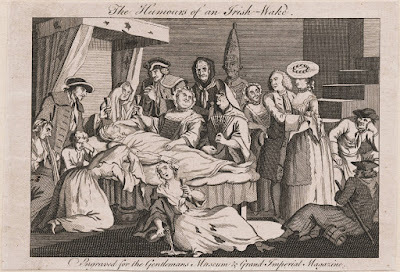 'Humours of an Irish Wake,' unknown artist, 1770, Lewis Walpole Library. 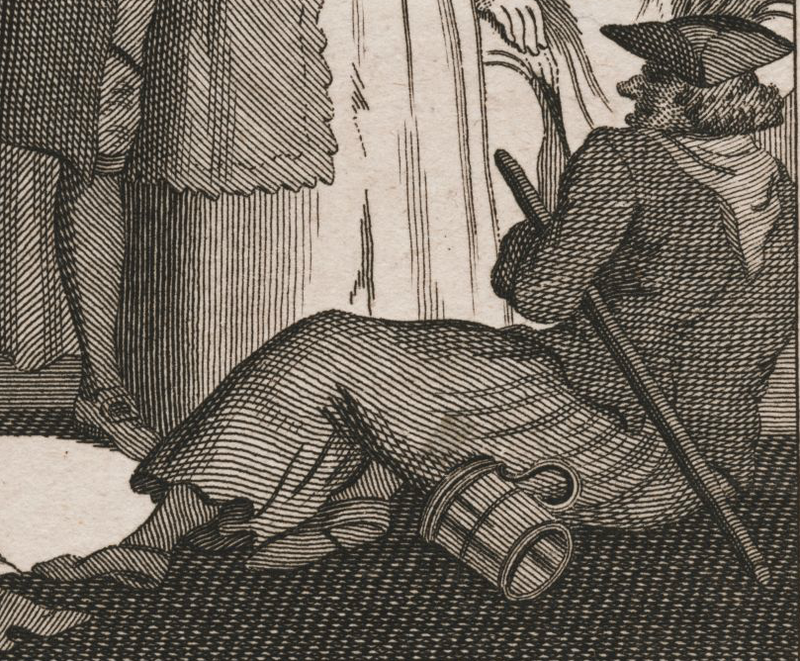 Yale University's Lewis Walpole Library has many, many original images of the eighteenth and nineteenth century that have been digitized in high resolution for the free perusal of the public. It is a gargantuan project, and one that is not yet complete. Not all of their images have catalog entries freely available as yet, so this print is not accompanied by an artist, engraver, or date. Thankfully, the HathiTrust Digital Library has exactly the reference we need to solidly date this piece. A fully digitized collection of the Gentlemans Museum & Grand Imperial Magazine contains an article detailing an Irish wake, explaining all of the characters we see here and even helpfully pointing out that there is a copper plate struck for this very story. The original article was published in November 1770. The Scotch Spy from London, despite his argument that he does not possess "the pen of a Gay or the pencil of a Hogarth," elaborates on the variety of guests at the wake of a hanged felon: soldiers, bailiffs, bawds, artisans and four sailors. There appears to be but one sailors depicted in the print. Immediately behind him stands a fellow that may well be an artisan, rather than a seaman. Our tar has a short brimmed cocked hat with a narrow point forward. His hair is curled up in a bob style, over a plain neckcloth that hangs down over the back of his jacket. The jacket is single vented. Under his arm is tucked the familiar walking stick. Plain, wide legged trousers run down to his calves. Beneath them are plain stockings and pointed toe shoes. Beside him is a large tankard, probably pewter.